It is long past time to be sharing these photos that have been inspirational to our brides. We have had the great fortune of having our paper and ribbon goods featured on many talented designers, artists and photographers Instagram feeds. While we have our own feeds (ote_seattle, and of_the_earth) they really don’t hold a candle to the creative skills shown in the photos we have seen. What we have planned here is to share with you the many photos with proper attribution. If you do end up sharing these with your friends and family, please be sure to give the appropriate nod or mention of the original group of skilled individuals so their work is not in vain. Custom printed hand made paper invitation. So happy to be a part of this wedding. Have a look at the stunning photos! As a wedding professional with 20 years experience, I am regularly consulted on proper etiquette. I always reply with two things in mind; what I already know about the event in question and what would kindness dictate? In most answers I attempt to influence my customer with kindness as the guiding principal. Should we include everyone’s name on the invitation or just the bride’s parents if they are issuing the invitation? If you risk hurting someone’s feelings, choose kindness. Should we send thank you notes to every guest that attended or only ones that brought gifts? Were you happy that they attended? Send them a note to express your thanks. Choose kindness. Should we include information about our gift registry on our invitation? Do you want your guest to feel like a gift is their admission ticket to your wedding? Don’t mention gifts with your invitation. Having your family and friends witness your wedding vows has nothing to do with loot and everything to do with supporting the new couple from the very beginning of the sometimes rocky journey that is a marriage. Choose kindness. Don’t cheapen your ceremony with the slightest impression of greed. If someone is asking their invitation guy for advice; they are either trying to find out quickly without doing their own research or they are checking to see if their mom is really right. In most cases, mom is right so listen to her first. She represents half of the invited guests and knows what is common or appropriate for those guests. You may need to temper what mom offers up as there are two families being joined and they may have different ideas of what is proper. This can be based on cultural or regional etiquette that is best to work out with the families involved. What this becomes is a learning moment for the bride and groom, one of many in the planning of the event. You need to ask the question of each other “Is it important to you that we are formal or casual in our planning and execution for our event? Once you agree on the tone you can ensure that you follow the etiquette that represents the proper level of formality. To ensure that you follow proper etiquette for your event you really have to have a conversation (or several) with your parents, with your bride or groom to be, with your wedding planner, and even with your invitation guy. Once you have gathered the myriad opinions I suggest you make your decision based on kindness. There really are a million ways you can plan your special day and once you have decided what is proper for your event, there will be opinions contrary to yours. If you do choose kindness, it will never be the wrong answer. A quote from this article was published on page 50 in the January 2015 edition of the Seattle Bride Magazine. We are loving our new die cut machine and all of the wonderful dies that we have to experiment with. For our 2015 bridal season we hope to stun the brides with these unique, highly customizable, earth friendly invitation suite holders. These are currently being made in all of our card weight stocks. Both the cotton and the lotka handmade papers display wonderfully. Pictured here are the lotka fibers. We offer the seeded papers too! Currently we have them sold only as single pieces. Coming soon will be full invitation suites with reply cards, custom printed invitations and envelopes. We will also be adding options for you to embellish these and make them more personalized with matching ribbon, belly bands and hand dip dyed edges. You can find the new pocket folds here, invitation_pocket_fold order your sample or set today. The trouble with online reviews – How do you decide who to listen to? A close friend of mine just had one of the worst weeks a small business owner can have. There are many challenges we face and overcome from every angle you can imagine but one of the toughest is from difficult people. He had to fire an employee this week that may end up dragging out into much drama over the next several months (or even years if it goes all courtroom). I think the hardest part for him were the very personal attacks that this employee threw around like so many dangerous, virulent seeds. These squeaky wheels get so much more attention than they deserve and as the one under attack, we often feel that there must be some truth to their accusations, otherwise they wouldn’t be saying those hurtful things right? Not so. Some people are only happy when they are stepping on other people. We need to be able to filter those people out. With that in mind I have found a way to address an unhappy individual that I dealt with last November. I wanted to respond to her Yelp review, I wanted to find her own Yelp business page and leave her a few choice comments, I wanted to scream and throw a tantrum, but I chose to not dignify her comments with a response. And then today we received a lovely email from a customer and this is how I have decided to address the issue; by speaking about it here on our own blog. Thanks for reading and understand that in our very connected world your every action has the ability to ripple into far greater lengths than ever before, so be nice! I happened to go on Yelp today and noticed that you have two Of The Earth pages on Yelp…and the more current one has only one review, a repeat of the one negative review from your original page. I wrote my own review with five stars, but combined with that other one you still only have a 3-star average. If you didn’t create that Yelp page you can probably claim it and delete it — it’s better not to have two, so you should be able to just update the address on your original one, I’m not sure about that though. Let me know if you do delete that one and I’ll be happy to put my review on your other page. Thanks again for the invitations — they are amazing! Thank you for your message. I am very glad that you are happy with your invitations. Thanks for the gift of your time in leaving a public review for us. We really do appreciate it. I think Yelp can be a helpful tool (I have used it to find out about yoga studios close to home) but I have a bit of a beef with them (as you might guess) for more than just the Of The Earth listing but also from our many business owner friends who have spoken of their feelings of extortion when dealing with Yelp sales people. We moved our business last July (and five years prior to that move). When we moved in 2008, our one five star review (at the time) moved with us. When we moved in 2013 to our dismay we discovered that our Yelp page was not going to move with us. Yelp had changed their policies and we had to rebuild, with new images and data our Yelp page for our new location. None of our reviews moved with us. In December of last year we received our first review on Yelp in our new location. In Yelp’s business plan it made sense to them to ensure that that review was posted on both locations. You see, if we pay Yelp $1000 a month (no joke I talked to them at length) they ensure that any bad reviews are pushed to the bottom of the stack, perhaps even get lost on a back page, as long as the payments keep coming. In life you have to take a few lumps, so we have put pictures and data and our hours of operation on Yelp but we don’t have to pay them or support them in any way. We also don’t have to tolerate extortion from potential customers, even if that means facing an unpleasant public statement of questionable veracity. I am excited to read your review and again thank you for taking your time to let folks (on the interwebs) know that you were happy with your experience with us. Hand addressing envelopes – how to stand out from the junk mail. In this incredibly busy week as we gear up for the new bridal season and work on last minute plans for tomorrow’s flight to New York to set up our booth at the National Gift Show in Manhattan I was stopped for a moment, long enough to sit down even to enjoy a piece of mail that the dripping wet postman just delivered. It was a hand written thank you note from a woman in North Carolina who runs her own Calligraphy business. 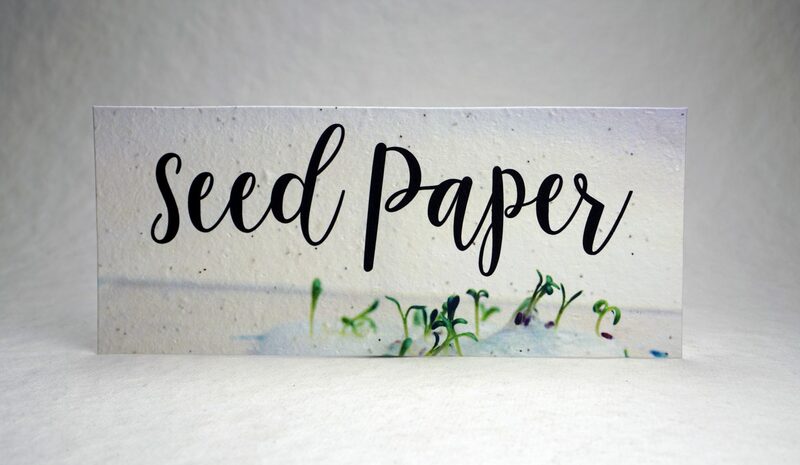 She sent us one of our own seed embedded envelopes back in the mail with beautiful hand lettering on the front and a business card and note on the inside. I think this can stand as a clear testament to the power of the personalized mailing. I know everyone is busy, I know I am busy, and yet this simple act of handwriting really can stop someone in their tracks for a few moments and draw their attention to the message you are sending. For all of you brides out their considering printing your guest’s names instead of hand writing them, don’t. Just take the extra time to let the people (you care enough about to invite to one of the most exciting days of your life) know that you really care. You really want them there and your own handwriting spells it out for them. It is that personal touch missing from so many areas of our lives today. Your extra effort will be noticed and appreciated. It really does make a difference. Okay so clearly we don’t all have amazing handwriting like the image above, but still you have family you can enlist to help, you can pick up a book or watch a video demo for pointers and tips on improving your own handwriting. Start early and it will be manageable, and worth it. Mary Andrews contacted us this week to share photos and details of her wedding via her Real Weddings post on The Etsy Blog. The gorgeous affair took place in Richmond, Virginia where Mary, a Merchandise lead for Etsy, and Tim, a freelance writer, blogger and food stylist work and live. Mary used our seeded paper to create her save-the-date, featured in the invite suite above. We love working with all our brides, but this was one rather special considering she works for and sourced many of her wedding elements directly from Etsy. For a list of all Mary’s resources, check out her My Etsy Wedding page. And to follow Mary and Tim’s love story and their adventures in creating a sustainable life in Richmond, check out their blog 17 Apart. Our 2014 Seattle Wedding Show Invitations Display – Video! We just returned from the 2014 Seattle Wedding show two day event that was a remarkable success! The show was very well attended, with aisles full of smiling brides and their retinue of sisters, friends and family in tow. We displayed several new invitation and paper designs along with our timeless styles that never fail to please. Here is a five minute video that takes you through our booth from top to bottom. We hope you have an opportunity to visit us in our new store in this new year and view these designs and more in person. Our shop has hundreds of papers, dozens of invitation styles, wedding invitation assembly tools, guest books, seed paper by the sheet and much, much more. OREEKO (Organic, Green, Eco, Blog) is a trusted resource on the web for “reviews, how-to guides, current news & ideas on how to simplify green living”. We were listed amongst a group of hefty competitors (7 to be exact) as resource for Eco Wedding Invitations in their Green Wedding series. “The invite allows you to establish a direct line of connection with all your guests. Use it to make a statement that can be both memorable, personal and green!” We could not agree more! Our only surprise was that our greenest product trait – that our papers generate oxygen when planted – was not mentioned in the flattering description of our goods. You can read the entire post here and follow the OREEKO blog, which covers everything from weddings to style to food and health, here. It is a favorite read in our world – many thanks to OREEKO for the nod!